HOLIDAY INN (1942); Dir. 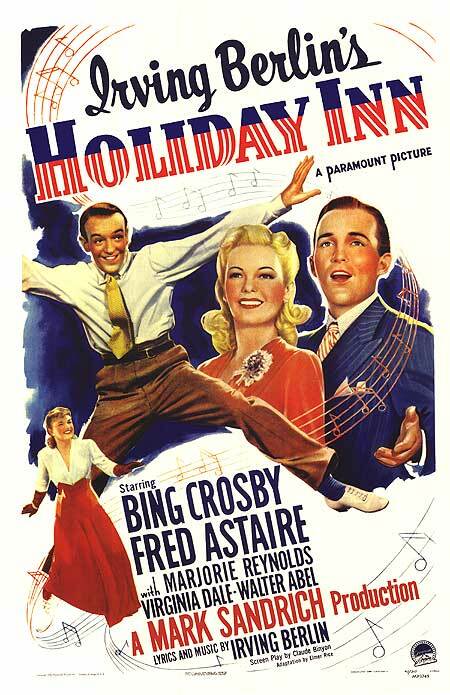 Mark Sandrich; Starring Bing Crosby, Fred Astaire and Marjorie Reynolds; Friday, Dec. 20 – Wednesday, Dec 25 (visit the Plaza Theatre website for times and ticket prices); Plaza Theatre; Trailer here. WHITE CHRISTMAS (1954); Dir. Michael Curtiz; Starring Bing Crosby, Danny Kaye, Rosemary Clooney and Vera-Ellen; Wednesday, Dec 25 – Tuesday, Dec 31 , in repertory with MIRACLE ON 34TH STREET (1947) (visit the Plaza Theatre website for times and ticket prices); Plaza Theatre; Trailer here. How much Bing is too much Bing? Trick question. There can’t be enough Bing this time of year. So when the Plaza Theatre offers up Der Bingle in HOLIDAY INN and WHITE CHRISTMAS—teamed with stars like Fred Astaire, Rosemary Clooney, Vera-Ellen, Danny Kaye and Marjorie Reynolds and built around numbers by the legendary Irving Berlin—well, it’s a Christmas present for every classic Hollywood musical lover. In 1940, songwriter Irving Berlin came to Paramount Pictures with an idea he’d first toyed with after writing the song “Easter Parade” in 1932: a film set at an inn open only on holidays, featuring a series of different holiday-themed musical numbers. Fred Astaire and Bing Crosby—both riding high on waves of popularity—were quickly attached to the project, and filming began on November 1941. However, despite its reputation (and that the film begins and ends during the holidays), the film isn’t really a Christmas film at all. It’s the tale of a love triangle between Jim Hardy (Bing Crosby, as the retired stage performer who runs Holiday Inn), Ted Hanover (Fred Astaire, as Jim’s caddish former performing partner on a path set for stardom) and Linda Mason (Marjorie Reynolds, as the inn’s featured performer and Jim’s love interest, who is tempted by the future of fame and fortune promised by Ted). As a result, the film has become somewhat pigeon-holed as a Christmas staple, even though little of the film takes place during that holiday (the Fourth of July seems to take a much more prominent role, due to the bombing of Pearl Harbor plunging the country into war during the filming). What the film lacks in explicit Christmas content, though, it more than makes up in the fantastic performances of Bing Crosby and Fred Astaire. Berlin’s music is tailor-made to be sung with the easy-going elegance of the film’s stars, and Astaire is at the top of his game during the film’s dance sequences. Marjorie Reynolds is a standout dancer and utterly convincing as the aspiring performer Linda (though her singing was dubbed by Martha Mears). The film is crisply directed with a sure hand by Mark Sandrich, a veteran of numerous Fred Astaire/Ginger Rogers musicals, and his camera showcases the musical performances beautifully. 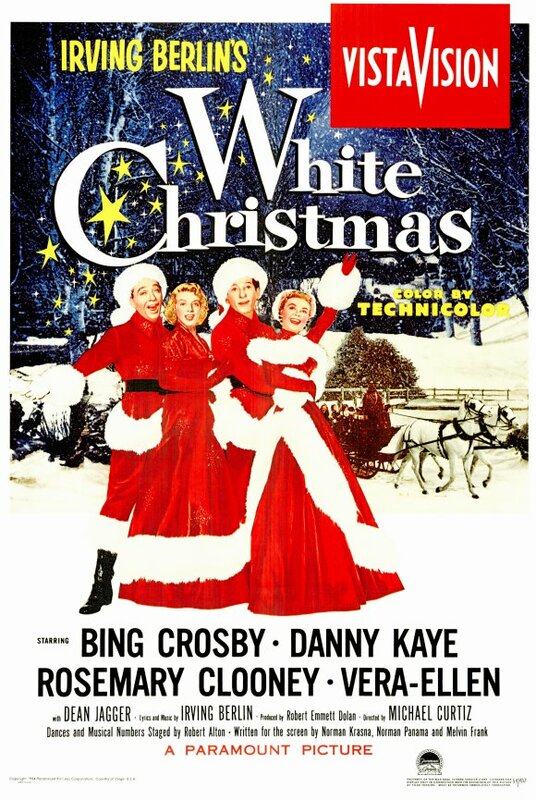 Because the film was such a success, and because people just kept buying that Bing single, Paramount decided to return to the well again 12 years later with the film WHITE CHRISTMAS. It was intended to be the third Crosby/Astaire/Berlin feature (after 1946’s BLUE SKIES), but Astaire passed on the script. Crosby did, too, deciding to spend time at home after the death of his wife. When Bing returned to the project, finding a co-star proved problematic. Donald O’Connor was slated to take Astaire’s role, but suffered an injury prior to filming, so Danny Kaye stepped in at the last minute. Determined to take full advantage of “White Christmas”’s perennial popularity, Paramount decided that the entire film should take place at the holidays. This time, the plot revolves around two ex-Army men who have made it big in show biz after WWII (Crosby and Kaye). They find themselves tangled up in a romance with two aspiring singer/dancers (Rosemary Clooney and Vera-Ellen) and a deal to perform a new show at a ski resort run by their former commander over Christmas. However, when the winter proves unusually warm and no snow is due on the forecast, the resort’s future is in jeopardy and the team step in to try to save the day. Keeping in line with the song’s continued success, the film was the top moneymaker of 1954, bringing in almost twice as much as its closest competitor, THE CAINE MUTINY. And why not? It’s hard to go wrong with such an appealing cast and such a great set of Irving Berlin tunes. However, I feel it lacks the dramatic edge of HOLIDAY INN, and while it may be a more traditional Christmas movie, it errs on the side of schmaltz a little too often for my taste. Danny Kaye makes for a particularly saccharine replacement for Astaire, replacing Astaire’s lean elegance for a cloying sweetness. But on the plus side, Crosby’s as on as he ever was (though he’s a bit long in the tooth by this point to be the love interest of Rosemary Clooney, some 25 years his junior), and Clooney and Vera-Ellen are both incredibly engaging. Director Michael Curtiz brings his trademark flair for inventive camera set-ups and capturing the emotion of a scene to the proceedings and makes the film—Paramount’s first shot in the widescreen VistaVision process—a visual delight. My small criticisms aside, the film is undoubtedly worthy of inclusion in the pantheon of great Hollywood musicals, and is a bona fide Christmas classic. With the holidays as hectic as they are, it’s important to take the time to cool down. And here’s a perfect excuse to do just that. Simply sit back at the Plaza and let the glorious tunes of Irving Berlin and the incomparable pipes of Bing Crosby carry you away to a White Christmas of your own. OK, lovers, it’s back to the grind. It’s too late to check out ATLRetro’s top 3 picks for Valentine’s night, so let’s get right to the rest of the week. Joe Gransden is back at Twain’s in Decatur for a jazz jam session starting at 9 PM. Or head back in time and over there to A NOVEMBER DAY: A WAR STORY, a timeless fable about friendship set against the backdrop of World War I, presented today by Thingumajig Theatre of West Yorskshire, England, today through Sun. at The Center for Puppetry Arts. 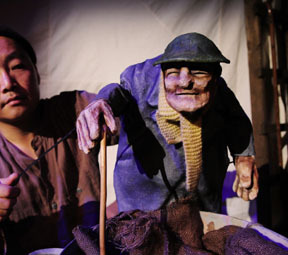 Performers use hand, rod and shadow puppets, live music and a transforming set to tell the tale of a British soldier in WWI and his unexpected friendship with a stray dog. Suitable for ages 10 and up, with a teen and adult workshop on Sat. Feb. 19. THE RED BALLOON takes flight at Theatre du Reve in 7 Stages’ Backstage Theater from Feb. 16-27. The stage adaptation uses puppetry and live original music to bring to life the classic 1956 French movie about a boy who befriends a shiny red balloon. Suitable for ages 4 and up. Get ready to rumba, cha-cha and jitterbug at the weekly Swing Night at The Glenwood. Catch Joe Gransden every Wednesday night at 8:30 PM at Jerry Farber’s Side Door. Alice Cooper meets Kiss Southern-fried in Red Rocket Deluxe, headlining at Star Bar. Dance to ‘70s, ‘80s and ‘90s hits during Retro in the Metro Wednesdays presented by Godiva Vodka, at Pub 71 in Brookhaven, starting at 8 PM.